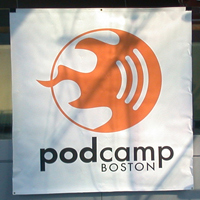 Podcamp is This Weekend in Boston: Its Not Complete Without You! Its that time, when a few hundred online types gather for Boston’s social media un-conference, Podcamp. Yes, there are topics — but these are looser than at regular conferences, and they’re 100% driven by the audience. Its fun, personal, cheap, and it really is the place to click-in with a core group of Massachusetts digital doers. Here are a few sessions I”m looking forward to at this year’s #PCB6. Hope to see you there. And, if you’re new to Boston’s digital scene, this is a key place to come and plug in. Here’s just a taste of the digital awesome ahead. While nobody can tell you exactly how to build your next innovative digital business, the deterrents to digital success are well known. Taking lessons from my work helping firms remake themselves through digital technology, I’ll share some common patterns that create obstacles, and ways firms have successfully taken them on. Chris Brogan (in photo above), Why Google+? Then What? Are social media enthusiasts finding Google+ to be a useful medium. Or is this a fantastically designed bridge to nowhere. Pocamp founder and man-about-the speaking circuit, Chris Brogan has a point of view at the ready. Let’s face it, nothing happens until someone sells something. And that’s what Mr. Cutler has been doing since before we were both geezers. Nobody is more interactive than Culter. And I’m hoping that he’ll play some harmonica between sessions. Please, join me in hounding him about this. Tom Catalini – Improve your blog’s image with images! I really want to see this. Fortunately, Podcamp is governed by the rule of two feet, which allows wandering between sessions. This way I can satisfy my desire to be three places and once, and to continue to cultivate mid-life ADD. Tamsen, a self-described intellectual magpie, is a ton of fun and great ideas. She leads digital strategy for a fine agency in our fair city. Doug was early to the intersection of digital and public relations. And hearing what’s on his mind is a great view on the promises and challenges of digital PR. Chris is a Podcamp founder, and extraordinarily nice guy who will have a honed presentation. Ja-Nae Duane has been on a Revolutionary Roadtrip spreading social media savvy, much as the Scooby gang once toured our nation uncovering ghostly hoaxes in abandoned amusement parks. She is head of social marketing for a local agency, an opera singer, and a fine ghost investigator in her own right. Paul Lyzun, Interview Techniques – no not for a new job, silly. Paul teaches video skills, and his presentations are a great way to learn hands on skills. Fortunately he’s presenting twice, but if you need to do on camera interviews, get in here. Sara ran New-B camp in Providence, and is smart, fun, and relentless up to good. Though Lane is quite young (somewhere below 18 still I believe) he’s earned a voice as a philosopher of why being online is good for us. She just nailed with a question in my Web3.0 session last year, and since then, I’ve seen Georgiana all over the place sharing ideas on content strategy. She manages web communications for a local university, and I hear she’ll be keynoting at Gilbane Boston this Fall. Don’t miss, she’s awesome! If anyone knows about managing chaos its Chel, who has been lead organizer of the last two Podcamps. She’s also out sharing her views about the online world, and anyone who can help get people to Zero in any inbox has “the power”. You will leave this workshop with the tools to assemble single page maps to renovate existing businesses approaches, or show how your new approach will obsolete competitors. Mari Anne Snow – Teaching social media to the next generation of social media professionals. Besides being the best professor on social media that I know, she’s also an accomplished business advisor. I’ve attended several of her courses, and highly recommend hearing how she structures a fantastic learning experience that is far from ordinary. You can see the full Podcamp Boston schedule here, and $30 registration tickets (good for the whole weekend) are available, this way. 33 Responses to "Podcamp is This Weekend in Boston: Its Not Complete Without You!" Hey Dave – Psyched to see you (and the hundreds of other Podcampers) this weekend! Bring on the “Deadly Sins” – !! What i don’t understood is in fact how you’re now not actually a lot more neatly-favored than you may be right now. You’re very intelligent. You know thus significantly when it comes to this topic, produced me personally believe it from a lot of varied angles. no abría hasta las 09:00h. the users are truly sharing fastidious thoughts. site is in fact good and the visitors are truly sharing pleasant thoughts. the web viewers; they will take advantage from it I am sure. Without You! | UsefulArts.us is a little boring. write post headlines to get viewers interested. You might add a video or a related picture or two to get readers interested about what you’ve got to say. I am genuinely glad to read this weblog posts which includes tons of helpful data, thanks for providing these data.